This sign is on the opposite wall from Baldwin Belting at 286 Spring St. Thurston & Braidich were importers of drugs, vanilla beans and gum arabic. They were located here from 1936 to 1958. The company was formed in 1884 as a successor to T. B. Merrick & Co., an importer of drugs. Originally located at 128 William St. in downtown New York, Thurston & Braidich expanded into their own building at 27 Cliff St. in 1915. This story from Simons' Spice Mill, Nov. 1915, includes an account of their early history: "The modern fireproof building now being erected for the sole occupancy of Thurston & Braidich at 27 Cliff St., through to Ryder's Alley, New York, on a lot of 26 by 165 feet, is the most noteworthy improvement east of William St. The building covers a plot of 4,250 square feet and the improvement indicates not only a healthy demand for modern buildings, but also the growth of the business of the lessees and the revival of business in their line. The business of Thurston & Braidich was founded in 1850, under the style of T. B. Merrick & Son. In 1870 the name was changed to T. B. Merrick & Co., with Thomas B. Merrick, William R. Thurston and William D. Patterson as partners. Mr. Paterson retired in 1882 and his place was taken by Adolph F. Braidich. In 1884 Mr. Merrick retired and the name was changed to Thurston & Braidich, the current style. After the death of Mr. Thurston, in 1889, the partnership consisted of Mr. Braidich and James G. Shaw, also J. Edward Young Jr. Upon the death of Mr. Braidich, in 1902, the present partnership was organized, with Mr. Shaw, Mr. Young and Charles R. Rosevear as members. The firm was originally located at 25-27 Cedar St. In 1875 they moved to 128 William St., their present location. ..."
Thurston was William R. Thurston, Jr. (1843-1890). He was listed as a member of T. B. Merrick & Co. from 1867. He was a Quaker and a member of the New York Monthly Meeting. His entry in the U.S. Encyclopedia of American Quaker Genealogy reads, "Thurston William R. Jr., s Wm. R. & Jane R. (dec), N.Y., b 10-27-1843 d 10-19-1890; m 11-4-1869 at Alden Sampson's, Maria H. Sampson, dt Alden & Sarah, N. Y." His obituary note in the New York Times, 20 October 1890, read, "William R. Thurston, Jr., senior member of the firm of Thurston & Braidich, drug importers, died yesterday at his home in Morristown, N. J. Mr. Thurston and his male ancestors for several generations were born in New-York City, and spent their lives here in business. He became interested in the importing line about twenty-five years ago. He leaves wife and four children." Braidich was Adolph F. Braidich (1850-1902), born 9 October 1850 in Trieste, Austria. A passport application in 1901 said that he emigrated on the steamship Scythia from Liverpool, England, to New York, 15 November 1880, and that he became a naturalized U. S. citizen in New York 5 January 1892. He was listed as a member of T. B. Merrick & Co. in 1882. His obituary note in the New York Times, 9 March 1902, read, "Adolf F. Braidich, senior member of the firm of Thurston & Braidich, importers of gums, died suddenly of heart disease yesterday at the Colonial Club, where he had lived for some years. He was born in Trieste, Austria, in 1850, and when thirty years old came to this city, entering the wholesale drug house of F. B. Merrick & Co. This firm later became Thurston & Braidich, and in 1890, on the death of Mr. Thurston, Mr. Braidich took into partnership James G. Shaw." Successor to William R. Thurston in 1890 was James Guthrie Shaw (1859-1920). He was born 10 May 1859 and died 29 December 1920. His brief obituary note in the New York Times, 31 December 1920, read, "James Guthrie Shaw, senior partner in the importing house of Thurston & Braidich, died Wednesday after an operation, aged 61. He lived at 29 Montgomery Place, Brooklyn." A longer notice appeared in Oil Paint and Drug Reporter, January 3, 1921, reading, "Mr. James Guthrie Shaw, senior member of the importing house of Thurston & Braidich, died on Wednesday, December 29, at his home, 29 Montgomery place, Brooklyn. Death came as the result of operation. He was in his sixty-second year. He was the youngest son of Sarah Story and Ephraim Shaw, and was born in Brooklyn. Entering the employ of T. B. Merrick & Co. as office boy, he advanced steadily through devotion to duties and marked ability. When the concern was succeeded by Thurston & Braidich Mr. Shaw continued in the service of the new house. In all he served forty-nine years with the two companies. On the death of Mr. Thurston in 1890 he became junior partner, and when Mr. Braidich died in 1902 became senior partner. Throughout the trade he was well known and universally liked both by competitors and customers. Up to the time of his death Mr. Shaw remained in active direction of the firm's wide interests. Funeral services will be held privately from his late home at 29 Montgomery place on Saturday morning at 10 o'clock. Interment will take place at Greenwich, Conn., where Mr. Shaw summered for many years. Surviving him are Edith Young Shaw; a son, Guthrie Shaw; two daughters - Mrs. Erskine Clark Paris of Hudson Falls, N. Y., and Mrs. Albert Merritz Billings of New York and Santa Barbara, Cal. - and two sisters - Mrs. Leonard C. Bond and Miss Ada E. Shaw. ..."
Also a partner at Thurston & Braidich was Charles Robert Rosevear (1858-1934). Charles R. Rosevear was an immigrant from Cornwall, England, and lived in Montclair, New Jersey. His obituary in the New York Times, 24 September 1934, read, "Montclair, N. J., Sept. 23. - Charles Robert Rosevear, a partner in the New York importing firm of Thurston & Braidich, 55 Vandam Street, with which he had been associated for forty-three years, died at his home here late last night after an illness of several months. He was born in Cornwall, England, seventy-five years ago. Surviving are his widow, Edith Doremus Rosevear; two sons, Charles R. Jr. and Lloyd K.; two brothers, John and William, and two sisters, Mrs. Philippa Muchmore and Miss Ellen Rosevear. Mr. Rosevear belonged to the Lake Hopatcong County Club and had owned and sailed yachts on the lake for years. He was a member of the First Congregational Church of Montclair." A later partner at Thurston & Braidich was James Edward Young, Jr. (1867-1941). J. Edward Young, Jr., was the brother-in-law of James G. Shaw, who married his sister, Edith Young (1865-1943). An obituary notice in the New York Herald Tribune, 15 June 1941, read, "Brockville, Ont., June 14. - J. Edward Young of New York and Malloryville, Canada, a partner in the gum importing firm of Thurston & Braidich, of 286 Spring Street, New York, died here today at St. Vincent de Paul Hospital, after an illness of two-and-one-half years. He was seventy-four years old. Mr. Young became associated with the firm fifty-eight years ago and had been a partner for thirty-five years. Surviving are his wife, Mrs. Minnie Young, and a daughter, Mrs. Tracy Hunter, of New York." The predecessors to Thurston & Braidich extend back to 1839. This account from Merck's Market Report and Pharmaceutical Journal, October, 1893, describes those earliest years: "In 1839 Llewellyn S. Haskell and Thomas B. Merrick, fellow-drug-clerks in Hallowell, Maine, joined forces and established a wholesale drug-house in Philadelphia, Pa., where they continued about five years. They then removed to No. 10 Gold Street, New York, and a few years later admitted Buckland W. Bull, of Hartford, Conn., into partnership. The partnership of Haskell, Merrick & Bull soon attained an enviable reputation for honorable dealing and quickly took the front rank in the drug trade. The firm was especially distinguished for the excellent quality of their Essential Oils and other articles used by perfumers. They were fortunate also in having in their employ Mr. Fresnau Hunn, a young man of rare skill and ability as a perfumer. Here, with the choicest of materials and the rarest genius, the foundations were laid for the celebrated "Lazell's Perfumes." In the year 1855, the business of Haskell, Merrick & Bull was divided, the package department being transferred to No. 44 Cedar Street, while the jobbing portion was continued at the old premises, No. 10 Gold Street, by the newly organized firm of Lazell, Marsh & Hunn, composed of Lewis T. Lazell, Edward H. Marsh, and Fresnau Hunn. ..."
Haskell & Merrick, then, began in Philadelphia and moved to New York ca. 1844. Doggett's city directory for 1846-47 listed Haskell & Merrick, wholesale druggists at 10 Gold St. This company became Haskell, Merrick & Bull in 1851. Haskell, Merrick & Bull moved to 44 Cedar St. in 1856. This became Merrick & Bull in 1861, then T. B. Merrick & Son 70 William St. in 1865 and T. B. Merrick & Co. in 1867. T. B. Merrick & Co. moved to 25-27 Cedar St. in 1871, and then to 130-132 William St. in 1876. 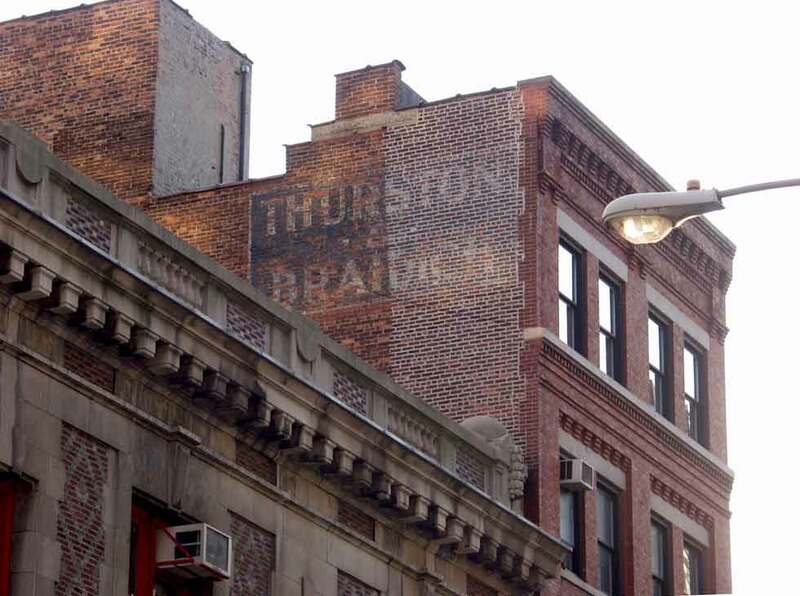 It was here on William St., when Thomas B. Merrick retired in 1884, that Thurston & Braidich was formed. Primary among these early figures was Thomas Belsham Merrick (1813-1902). He was born 27 April 1813 in Hallowell, Maine, and died 13 June 1902 in Philadelphia, Pennsylvania. As far as I can discover he received only the briefest notice in the New York Tribune, 16 June 1902, pg. 7: "Merrick - At Germantown, Penn., June 13, on Friday, June 13, 1902, after a brief illness, Thomas Belsham Merrick, formerly of Hallowell, Me., in his 90th year. Relatives and friends are invited to attend the funeral services on Monday afternoon, June 16, at 4 o'clock, at his late residence, Church Lane and Chew-st. Interment private." This ad for Thurston & Braidich appeared in Polk's New York City Directory, 1915. This one from a year later shows their move to 27 Cliff Street. This notice from the New York Herald Tribune, 8 Sep. 1936, pg. 33, describes their move to Spring Street: "The 286 Spring Street Company, Jacob Pfister president, has leased the six-story building at 290 Hudson Street and 286 Spring Street, forming an L around the southeast corner, to Thurston & Braidich for ten years from next May 1. ..."
The Thurston & Braidich Building at 27 Cliff St. survives as of June 2016 as an office building without inscription.